If you're looking for a small car with an upscale interior, a smooth ride and an All-American nameplate, the 2010 Chevrolet Cobalt is a worthy alternative to the Ford Focus. The Cobalt is also easy on gas, a key point of interest for many new car shoppers. The 2010 Cobalt LT is a small 4 door sedan. Its trunk is hard to lift up and there is no trunk release inside of the car by the driver. The shifting column is between the front seats instead of near the steering wheel. It is a reliable car, however the battery runs down easily if you forget to turn the lights off and leave it for even an hour. Then after the battery dies you cannot take the key out of the ignition and have to get it jumped. The car does not warn you as you are exiting the vehicle that you have left your lights on. The nice thing about needing to jump start it is that there is a jumping port located underneath the hood because in order to access the actual battery you would need to get in the trunk. The door handles are cheap and break off easily and take over $300 to fix. The driver side airbag leaks water any time it rains which is a known issue with these vehicles to which no recall is present. The seat belt is annoying to deal with but there is a user fix to that. The cobalt keeps me going daily - on my job, store, and activities. 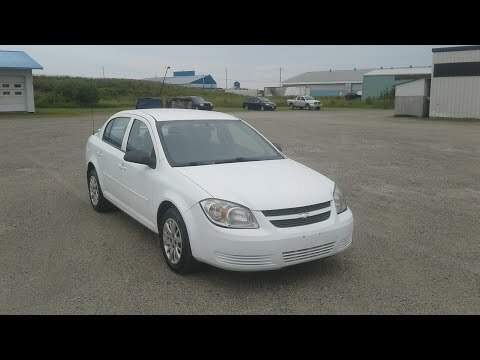 This 2010 Chevy Cobalt used to be my fathers - he only drove it locally so the mileage is low. Something is wrong with the front suspension but the dealer said it is ok to drive on (because it is too expensive to get fixed for me right now). Other than that, it is been a good little car - no major problems (I get the oil changed regularly). I think the one thing I do not like about it is, there is no lumbar seating (I drive a lot and that would be a good support on my back - right now, this car hurts my back from driving so much). The trunk is very spacious and when I put the back seats down, I can get a lot of stuff in the car! It seems to handle well in bad weather (water/snow) - I never had issues with it in the weather. Other than it being 8 years old now, one thing it is doing: it is beginning to make a loud noise when I turn the fan on for defrosting or heat/air, it is been very annoying (I just turn the radio up)! It has been serving my purposes very well. Perfect car for family, friends and commuting to and from in your daily lives. I love our car! It's one of the best cars I have ever had. It's been a very dependable car for me and my family. It's been a very low maintenance vehicle and when I have had to buy any kind of repair parts for my car they have been very affordable. My family is very comfortable. Traveling in this vehicle and there is some storage and leg room for a small car surprisingly! As long as I keep my car serviced I get amazing gas mileage also. I also keep my tires rotated and this seems to help with even better gas mileage. I commute back and forth to work a long ways everyday and I love that I feel comfortable and safe not having to worry about being. Stranded. All in all this has been an amazing car for me and my family and it still is!